It's so freaking cold out there. Well, not here in LA, where I'm wearing my usual tube top and Daisy Dukes, but in a huge chunk of the country, where it's unreasonably, improbably cold. So what's this mean for your poor car? For most people, cars, no matter how loved, are not able to come inside and cuddle with us under a big pile of blankets on the couch. While we all agree that's a crime, we need to accept it and do what we can. 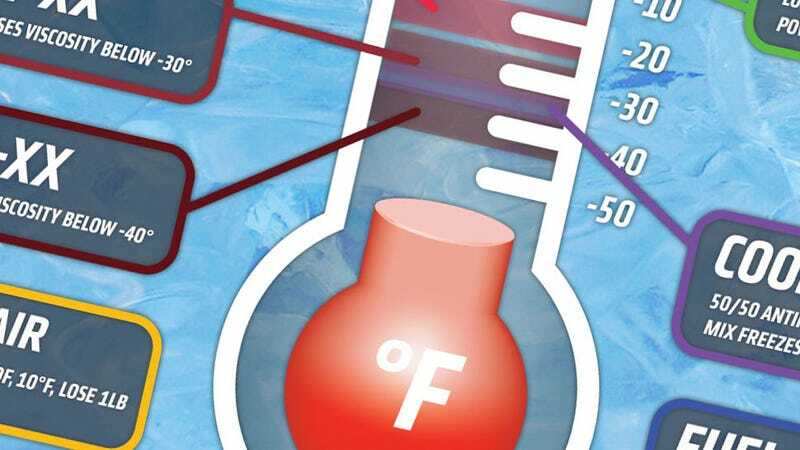 With that in mind, here's a chart for you, that will show you exactly how the various materials and fluids of and in your car are affected by extremely low temperatures, and slow, lazy, cold molecules. I hope it helps! UPDATE: I accidentally had a misplaced - sign, making tire elasticity happen at lower temperatures than it happens. It's actually 45°F/7°C, and fixed in the chart. Also, I fixed my misuse of 'viscosity' and made it now clear that viscosity is gained, not lost, as temperature drops. It gets thicker and more gel-like still, I just used the wrong verb.